When I was going through my stickers to find a teensy heart for 'The Kissing Hand' raccoon, I came across some opossum (possum?) stickers I'd forgotten I had. There aren't a lot of opossum (possum?) crafts out there, so I decided to make one. 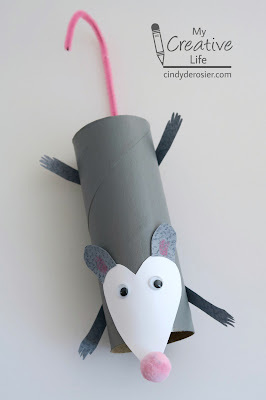 I'm always on the lookout for topics that aren't represented on Fun Family Crafts and a quick search determined we had neither opossums nor possums on the site. Once I did the research to learn the difference between an opossum and a possum, I proceeded, confident that the stickers were opossums and that's what I'd be making. 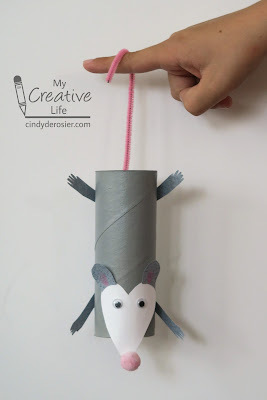 Start by painting the cardboard tube grey. 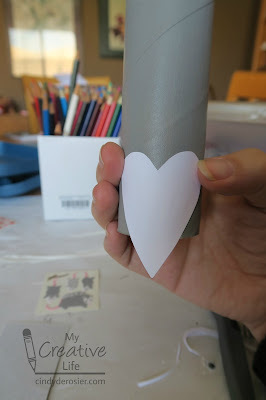 While it is drying, cut a narrow, elongated heart from white cardstock. When the paint is dry, glue the heart onto the end of the tube. A rubber band holds it in place while it's drying. Cut a pair of skinny arms and a pair of skinny legs from the grey cardstock. Cut two rounded ears from the grey cardstock and use the colored pencil to add pink shading to the centers. Bend them up slightly. Glue the arms, legs and ears in place. Add the googly eyes and the pink pom pom nose. Finally, bend the pipe cleaner to make a tail. Secure it inside the tube with tape or hot glue. A completed opossum! I'm glad it's an opossum and not a possum because that means it goes in Letter O which is more sparse than Letter P. It's the little things. This is ADORABLE! I love it!!!!!!!!!!!!!!!!!! You are rocking those toilet roll tubes! This one's a cutie! Hope you have a wonderful weekend! Thanks for the inspiration!